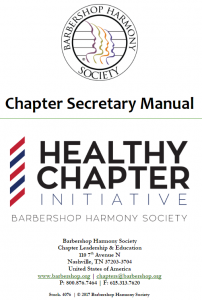 Our new Chapter Secretary Manual is available for all new and veteran chapter secretaries. Through the Society's Healthy Chapter Initiative (HCI), we've solicited content experts who have served as chapter or district secretaries. The Chapter Secretary Manual no longer has a sister document which was called the "Exhibits Manual". We've consolidated the general manual and exhibits manual to include appendices towards the end of the document for easy reference and guidance. Chapter Secretaries also have access to modular online training videos through Harmony University Online. Easily downloadable from our online document center, the Chapter Secretary Manual is also available for purchase (hard copy) through our Harmony Marketplace (Stock. 4076). We’d like to thank the content experts who have assisted in updating this valuable tool for chapter and district secretaries. As always, for comments or questions please feel free to contact Antonio Lombardi, Manager of Chapter Leadership & Education at chapters@barbershop.org or 800.876.SING.